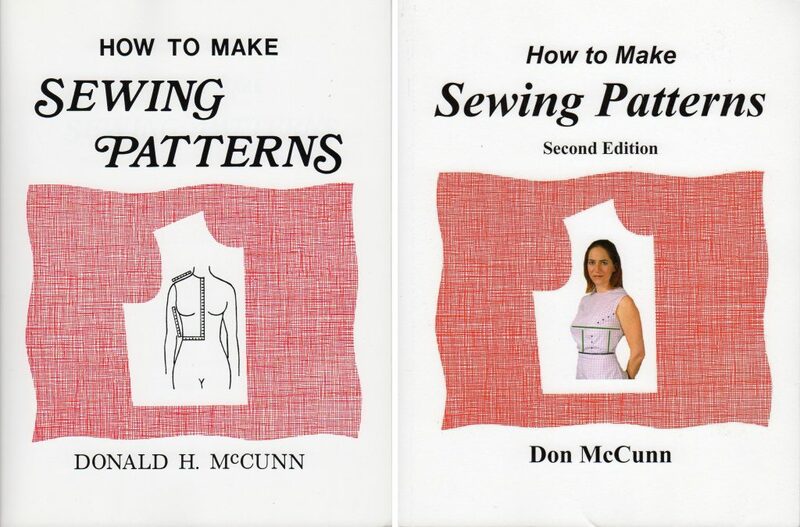 Don McCunn’s book How To Make Sewing Patterns came to me when I first started investigating fitting. It was recommended in response to my question on PatternReview’s discussion forums, asking for a treatment of the subject that catered to men’s as well as women’s physiques. Covers: First Edition on the left, Second Edition on the right. I feel fortunate to have learned pattern making from this book first, because it provides a conceptual basis to flat pattern work. It explains how seams and darts, pleats and gathers can actually shape fabric to fit a three-dimensional body. I reviewed the first edition for this blog. Recently I was contacted by the author, who let me know he has published a second revised edition. I was intrigued, because a weakness of the original work was the production standards on the technical diagrams, something that would be easy to fix with modern publishing tools. The author provided me a complimentary copy of the book for this review. No other form of compensation has been provided. How To Make Sewing Patterns, Second Edition is about the same length as its predecessor. As in the first edition, the book is structured into three main sections. The first section explains how to take detailed measurements of yourself or another person, then draft and fit a sloper pattern. A sloper is a basic garment (bodice, skirt or pant) that form fits the body with just enough wearing ease added to allow for movement. Slopers don’t have any sort of style lines or detail; instead they serve as building blocks for original garment designs. 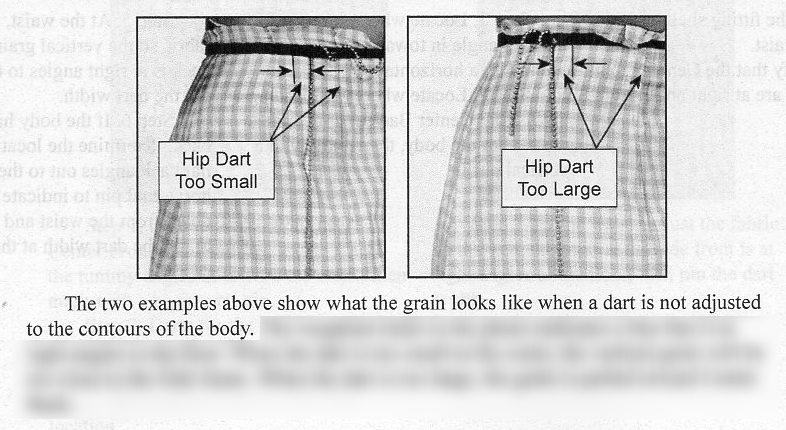 The second section explains how to manipulate sewing patterns to achieve various garment styles. 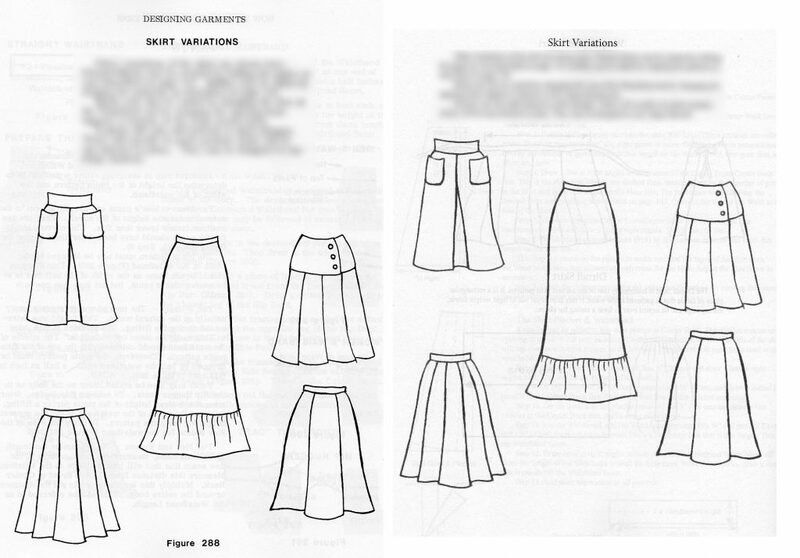 Instructions and diagrams show techniques for redrawing a pattern to add fullness to a pattern at various places, relocate darts and seams, or transform darts into pleats or gathers. The third section shows how to create specific design details, and original garments, using the sloper as a building block plus the pattern manipulations from the previous sections. The biggest revamp in the Second Edition goes towards the first of these sections. And it’s not just expanded and added material, but a revised and streamlined process for drafting and fitting a sloper. As mentioned, the new edition has completely redone photos and illustrations, created with digital tools rather than graphic art techniques of the 1970s. The new line drawings are much clearer and easier to follow than in the first edition. Diagrams from the Second Edition on the left, First Edition on the right. The new diagrams are clearer and easier to follow. A welcome improvement is longer and better conceptual introduction. The first book was strong in terms of explaining flat pattern concepts; how seams and darts shape fabric, and how fabric sometimes needs to curve along more than one direction to fit the body. In particular, I was pleased to see extra material on grainlines, and how important they are to a garment that fits and hangs well on the body. This was something that took me a long time to understand, and I’m glad the new edition emphasizes this point. The second edition offers a more complete description of the process of patternmaking – the overall process of capturing the body’s curves, drafting and a fitting sloper, then using the sloper as a basis for creating an infinite variety of original garment designs. The first edition also addressed measuring and fitting one’s self. The author was right to recognize that many people in his target audience may not have trained “fitting buddies” to assist them in self-measurement and fitting. The second edition simplifies the self-fitting process further. The first edition methods of using typing ribbon, lengths of string, and angled mirrors to self-measure and fit have been phased out in favor of self-photos via camera or smartphone. The author gives new tips on how to fit darts on one’s self, as well as recruiting helpers with no sewing training to assist with fitting. The sloper creation process has been substantially revised. In fact, this is the biggest change between first and second editions. Draping techniques now play a much larger role in creating and refining the basic sloper. Draping involves shaping fabric on a dress form or a live body to shape for fit as well as style. The inclusion of draping makes the instructions to draft an initial sloper shorter and simpler to follow than in the first edition. For instance, on the woman’s bodice, in the first edition you would draft in lines for the bust darts. In the second edition, you do not draw darts on the first draft. Instead, you cut the draft pattern in fabric, place it on the subject, and then drape in a dart to fit. Then you are shown how to transfer the draped darts back onto the paper pattern. The book shows you how to make a trial sloper in gingham fabric. Gingham is useful because its graph-like pattern shows the grain and the cross grain of the fabric. You place the trial sloper on the subject, then drape the garment by adjusting darts and seamlines by hand. The gingham helps you judge when the grainlines run vertically, as well as when the overall hang of the garment is properly balanced. These techniques are helpful for pattern fitting in general, not just as an aid to fine tune sloper drafts. Though I praised the first edition of the book for its coverage of both mens and women’s patterns, the second edition improves its coverage of men’s topics. For instance, in the section on drafting a bodice sloper, the men’s bodice front is described in a separate section from the women’s bodice front, along with a unisex description of the back piece. There is no need to pretend a man is a woman with a flat chest, as other patternmaking and fitting books make you assume. From the Second Edition, coverage of men’s physique and how a front pattern is drafted. This book also has an expanded section on designing patterns for knits, which was covered in very brief terms by the first edition. The second half of the book covers pattern manipulation techniques, and garment design. Other than updated illustrations, these sections are largely the same as in the first edition. In the sloper section, the book includes a basic sleeve draft, which hasn’t changed much from the first edition. First edition on the left, second edition on the right. In this case, not much has changed. As with the first edition, the audience for these books is the home sewer. It doesn’t cover the details of drafting a pattern for professional use. That’s okay; as a beginning sewist this made the book approachable and easy to understand. Nowadays, I have several pattern drafting books aimed at professionals and I would have been lost trying to start out with one of them. A big attraction of the second edition is the rework of the photos and illustrations. Though they are much improved over the first edition, photos as reproduced in the book sometimes lack contrast (likely an issue with the printing process), and are a bit too small to easily follow at times (as I encountered in the fitting discussions, centered around gingham muslins). Sometimes photos are too small to follow clearly, even with callouts. • How to true seamlines. For instance, squaring off matching corners, as at the underarm point, at the neckline at center front, or at the crotch seam on pants. • How to place notches on patterns. For instance, why armscye/shoulder notches are placed where they are. Or how notches can be placed to indicate where seams should be eased when sewn, for instance along a princess seam. From a design perspective, I found some topics that could have been covered. For instance, there is no discussion on gussets in sleeves or in pants, in terms of the role they might provide or how you would draft a pattern to include one. Also, the section on sleeve drafts would benefit from a discussion on sleeve cap height, and how a high, tall sleeve cap fits and looks differently than a shorter, shallow sleeve cap. Finally, I noticed from first to second edition some material has been removed. The biggest thing I noticed was the first edition included a short chapter on using a sloper to fit commercial patterns, which has been removed from the second edition. It was always a bit tangential in that the whole focus of the book is on techniques for creating original patterns. But the audience is the home sewer, who is almost certain to want to use commercial patterns at some point and could benefit from using their personalized sloper to adapt them. Overall, its removal is a loss. If it were only cosmetic issues and minor updates, owners of the first edition could be content to stick with the copy already on their shelves. However, I think the new sloper drafting process, together with the full discussion of fitting with gingham and grainline treatments, makes How To Make Sewing Patterns, Second Edition well worth considering as an upgrade from the first edition. The author also offers a companion DVD volume with lessons and tutorial videos. He provided me with an evaluation copy, that I will cover in a separate review. This entry was posted in Books, Reviews on November 6, 2016 by mportuesisf. Definitions sometimes differ — there is no consensus about anything in the sewing and tailoring world — but a sloper is more of a template for a pattern. It often features many more darts than one would ever use in an actual pattern. The person making the pattern decides which ones to trace off the sloper in the process of developing the sloper into a pattern. A sloper also usually does not have seam allowances. No seam allowances makes the template easier to work with. Some slopers are loaded with details, others are limited.The University of Fashion provides videos on drafting a number of different slopers, all for women right now, unfortunately. Thanks for the review. I own this book, but have never used it. Incidentally, how does this book relate, if at all, to David Page Coffin’s shirt making books and materials? (I know he’s a friend, or at least, a good acquaintance of yours who has helped you in the past.) I gather that Coffin, among many other things, shows readers how to fit patterns that have been copied from existing shirts, not make them from scratch. But correct me if I’m wrong. If you’re ever in a mood to splurge, I think readers would be interested in a review of Mike Maldonado’s shirt making course, but it’s something like $400. I have an Internet acquaintance who took it a few years ago and and was very happy with it. I’d like to take it myself some day, but as a woman, have other resources and the lessons seem focused on men. Those are all the subjects I can suggest right now in regard to men’s pattern making. David Coffin is (or has been) a reader of my blog, and he’s been kind enough to respond to some direct email queries I’ve sent to him. If he’s reading this he may want to address this question directly. But as I would paraphrase his strategy, he advocates copying a shirt that fits well as the quickest way to obtain a pattern draft. 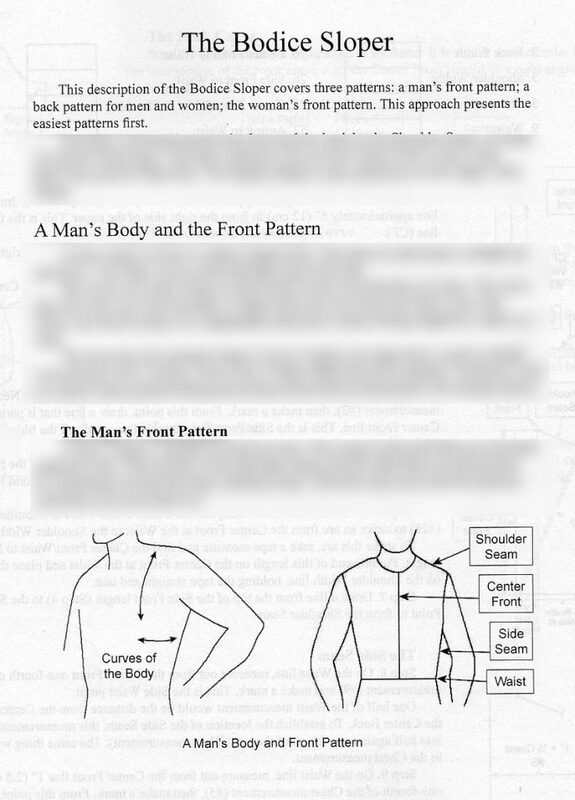 DPC describes a method for draping a shirt pattern in his first book “Shirtmaking”, and he covers the draping method briefly in his Craftsy class. His most recent book, “Shirtmaking Workbook” is based around different types of shirt blocks (dress, sport, knit, folk, jacket). The book describes the general defining characteristics of each block type, but doesn’t provide specific pattern drafts for each. But in general I’d say that DPC is more focused on style and construction than he is on fit. I’ve seen some of the freebie videos from Mike Maldonado, and agree the content is very good, even if the production quality leaves something to be desired. His course is definitely something for me to consider; I think what’s been holding me back is that I still have a backlog of Craftsy videos on tailoring and patternmaking for me to work through, as well as Kenneth D. King’s “Smart Tailoring” DVD set. Still reading the first edition, but the second edition sounds like something I’ll be ordering in the dead of winter when my sewing itch flares up (treated more by reading about, than actually, sewing). Great review! I know precisely how you feel. Craftsy and Senor King are tapping their respective toes (with hands on hips), whilst I do other things. Mike Maldonado will be addressed in my next life. I know what you mean about a backlog. I’ve read the other comments with interest and has some points to make in response. I’m busy right now, but will return later. I didn’t spend too much time on a precise definition of sloper because the focus of the article was more on McCunn’s book. But I do appreciate your filling in the details as to what a sloper technically is, and how it is used. Thanks. I’d like to thank Michael for taking the time to so carefully review my book. About the word Sloper: I avoided using the word “sloper” in the first edition of my book because it does not convey an easily comprehended visual image. For me, the most important thing when you are making patterns is to “think with your eyes.” So for the first edition I called these patterns “basic fitted patterns” which is pretty awkward. I also think the term “sloper” is in more common usage than it was back in the 70s, at least for people not involved in the fashion industry. For this edition I caved in to the shorter word for these patterns. My “fashion dictionary bible” is “Fairchild’s Dictionary of Fashion.” In this dictionary the word sloper is defined as “Basic pattern for a garment section, without style lines or seam allowances…” As I am sure most of your know, when you are creating the style lines for a design you use the sewing lines and not the seam allowance lines. Personally I always keep seam allowances on my slopers so I don’t forget whether or not the patterns include them: “Is this a fold line or a seam line?” I also do this because I keep my patterns on the dotted marking paper sold by the fashion industry. This is semi-transparent paper that allows you to place the paper for a new design on top of a copy of the sloper. This copy of the sloper can have the new design lines where you want them to appear on the body. I believe this is the best way of recording how you create a design. That way if you want to go back and rework a design for a different look, such as adding more or less fullness or changing a seam location, you have a record of what you did the first time. It is my understanding that in the industry slopers are kept on stiff paper that is opaque. Patterns can then be traced around the outside edge of the slopers. I have never tried this approach so I don’t know how one could remember how a design is created, especially adding fullness. If I had used this stiff paper to record my designs, I would have to rent a storage container to keep all the patterns I have created over the last 40+ years. As it is I have all my patterns stored in 6×9 envelops with copies of every iteration of a pattern’s design process. About Altering Commercial Patterns: Aaaaagh. I intentional left that out because over the years I have marveled at how Mother Nature never repeats the same shape twice of anything. The idea that people can be standardized in any way makes my skin crawl. For me making custom patterns is a way of celebrating the fact that we are all unique individuals. I bemoan the fact that people learn to sew from these standardized patterns. I am truly grateful I learned to sew and make my own patterns simultaneously. So this omission was a philosophical statement rather than a practical consideration. Guilty as charged! I really appreciate your very thorough review. I will add this to my wish list. One of the great things about the internet and sewing is that it’s easier to find the sewing guides that work for your brain (as we have different methods of learning). This is a good review of what makes this book work for you. Thank you for the thorough review. Donn McCunn’s comment about removing the section on altering commercial patterns has given me food for thought. I am trying to learn to sew garments precisely because my body doesn’t conform to RTW’s standard shapes, nor to most pattern companies’. So why am I using commercial patterns at all? I’m going to order this book! I agree with you that Don has a point. I don’t understand how a commercial pattern can have a good fit without being designed for a specific individual. I was led into patternmaking because the state of menswear patterns (at least modern ones) is pretty dismal; the styling is out of date or they cheapen the detailing to make the garments easier to construct. But, the commercial patterns also didn’t fit well. I have a ton of menswear patterns now, many of them vintage. But I’m still drafting my own patterns for new projects, now as much to have full control over style and details as much as for fit. I know this is an old thread, but if anybody is reading my comment, I hope you can help me with my particular issue: I want to make my own vintage-styled men’s garments, but for a taller man (I’m 6’2″). For the period I’m interested in (1950’s), extra-large wasn’t even a size commercial men’s patterns were offered in yet. What do you recommend? Trying to grade smaller vintage patterns to my size, or making my own patterns using slopers? I know nothing about sewing yet, and if my comment sound ridiculous, I apologize in advance. Thank you. I am sorry for not seeing this sooner! Both methods you propose can get you to your destination. Grading starts with a style you like, but it has limitations: once you grade up too many sizes, the resulting garment can have an inaccurate fit. And if you have personal fitting issues (in my case, forward shoulders and a slight tummy) grading isn’t going to address them. You will definitely need to make a muslin and fit the graded draft. Drafting a sloper from scratch, as described in McCunn’s book, will better address those issues of size and fit. But at the end, you will have a sloper garment – by definition, devoid of style and it will be up to you to adapt it into the vintage style you desire. I really can’t definitively advise one approach over another. Part of the decision process would include just how sophisticated the style of the vintage pattern is. If there’s a lot involved in drafting that style, it might make more sense to grade an existing pattern and then fit it to your body.